Young Anne Boleyn's life changed forever upon her arrival at the French court. She had come in 1514 the unwanted, awkward youngest child of a rising English family, and has returned to England in 1522, a darkly alluring young woman of great wit, spirit, and elegance. After having mistress after mistress throughout the course of his unhappy marriage, Henry Tudor alas meets his match and more in seductive and intriguing Anne Boleyn. But unlike the rest of them, she refuses to give herself to him. She will be his Queen or Nothing. The captivating tale of a girl's sexual awakening, a man's all-fickle-lust, and the fatal price for untamable passion - and reaching too high. 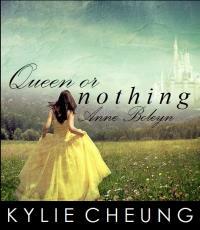 Young Anne Boleyn's life changed forever upon her arrival at the French court. She had come in 1514 the unwanted, awkward youngest child of a rising English family, and has returned in 1522, a darkly alluring young woman of great wit, spirit, and elegance.